Last week I told you about the impending demise of iGoogle -- and suggested three iGoogle alternatives. The response was great, with many readers sharing my dismay over Google's decision and others offering their own recommendations for replacements. With that in mind, I thought I'd share two more home-page options worth considering. One comes pretty close to replicating the iGoogle experience, while the other takes a totally different tack. If your browser favorites list hooked up with StumbleUpon, the result would look a lot like All My Faves. The site is essentially a massive collection of other sites, all represented by thumbnail icons of their logos. It's a little overwhelming at first, but there's an interesting portal beneath all the noise. Indeed, once you sign up for an account, you get to create your own batch of "faves" you can use to quickly jump to your favorite pages. You also get to choose up to seven areas of interest (cooking, movies, tech, etc.) that AMF will use to generate batches of sites you might like. After you finish the setup, you'll see a much less intimidating tabbed display of your favorites and your areas of interest. And thanks to the AMF bookmarklet, it's a simple matter to add sites to your start page. I'm not sure All My Faves is really my cup of tea, but if you want a favorites-oriented home page with lots of personalization options, this service is worth a look. A little bit NetVibes, a little bit iGoogle, Protopage offers a simple, attractive, customizable home page you can stock with news, comics, Twitter feeds, email, podcasts, and more. 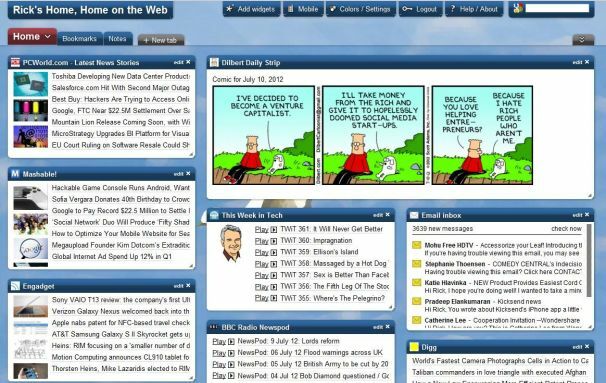 The site starts you out with a wide assortment of popular widgets, everything from Dilbert to Engadget to PC World. You can drag and drop these to create just the layout you want, while clicking Add Widgets lets you choose from a huge selection of additional tools and content. Protopage really reminds me of the portals of old. If you're already mourning iGoogle, this should help ease the pain.